“..the open glass door let in the sound of the babbling creek --a perfect background for a glass of wine or a cup of coffee (we had both)." —Beth M.
The Guest House at Glen Hollow sleeps four, featuring a ground floor bedroom with full-sized bed, an upstairs loft with king bed, a full kitchen, sitting rooms on both the ground floor and in the loft, and a full bath with our signature “waterfall” shower. The kitchen and downstairs sitting room is a charming space to gather. There is seating for four around the ventless, porcelain-glazed, cast iron propane stove. Kitchen cabinets hand-crafted from original barn wood are topped by counters made of concrete and maple, with a custom stain using wine from Keuka Lake Vineyard. 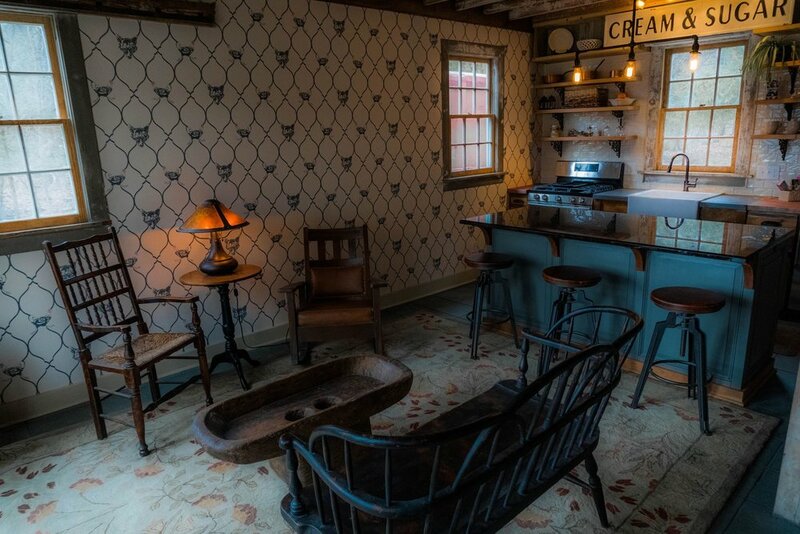 This cozy room glows from the original shiplap walls of Douglas Fir. Details include full-sized arts & crafts antique bed with memory foam mattress; sliding barn wood doors with access to the downstairs sitting room and bathroom; matching antique brass luggage racks from a turn-of-the-century Australian train car. Once a horse stall, this space offers rustic charm with modern amenities including: luxurious “waterfall” shower composed of rainforest showerhead, ledgestone, slate, and hand-crafted leaded glass; vessel sink composed of natural river stone; and a heated towel rack. Bath products from Occitane. 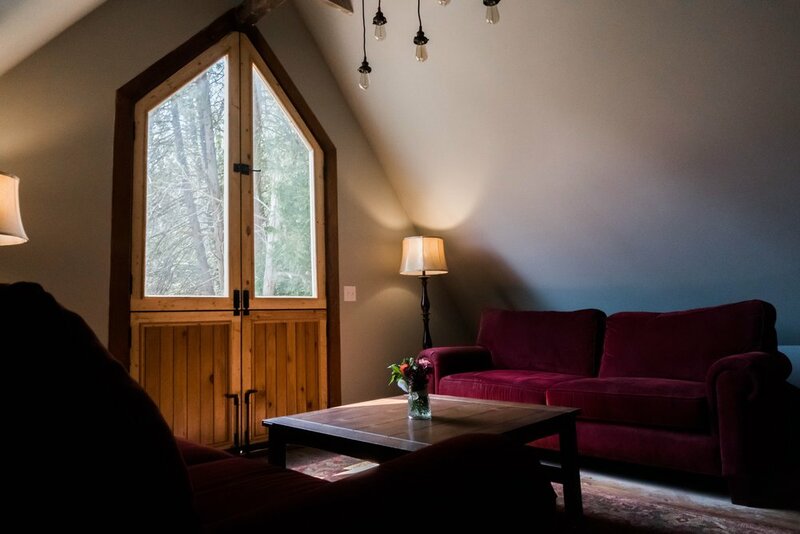 This lovely space includes an area for quiet relaxation with seating for four, a double Dutch door that looks out to the brook, and a flat screen TV. There is also a sleeping area separated off by a room-divider constructed from the original hayloft doors with a luxurious canopy king bed.